Montgomery Scott is boldly going where he's never gone before. In this new clip from "Star Trek Beyond," Scotty (Simon Pegg) finds himself stranded on a strange planet away from Kirk (Chris Pine), Spock (Zachary Quinto), Uhura (Zoe Saldana), and Bones (Karl Urban). As the trailer showed, the Enterprise crew is forced to abandon ship after a lethal attack by Krall (Idris Elba) and scatters across this planet. Scotty meets a mysterious scavenger by the name of Jaylah (Sofia Boutella), who is no friend of Krall. And she's willing to strike a bargain: If the engineer helps her, she'll help him find his friends in return. The quippy Scott and serious Jaylah could make for an interesting buddy comedy storyline. Certainly, the excellent makeup job and Boutella's clipped line delivery make Jaylah appear to be an worthy addition to the franchise. 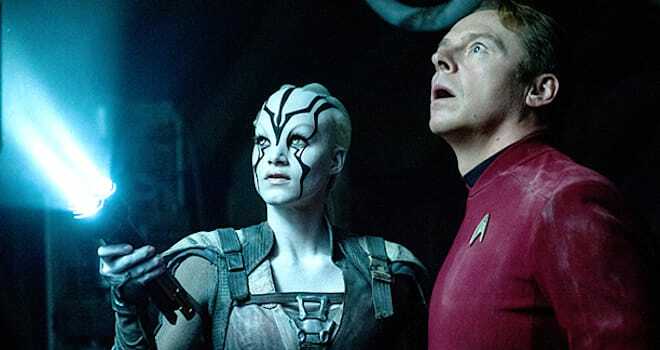 "Star Trek Beyond" is already shaping up to be intriguing movie. Recently, John Cho teased that Sulu will be revealed to be gay, making him the first LGBT character in the franchise. "Star Trek Beyond" opens in theaters July 22.